It’s been three years since the LVMH Hotel Management group launched its first hotel, the tiny eight-room White 1921, in Saint Tropez. Its sophomore equally all-white effort – and also named after the year the first building was built – has been worth the wait, though the difference in setting – steps from Courchevel’s highest ski peaks – could not be more stark. 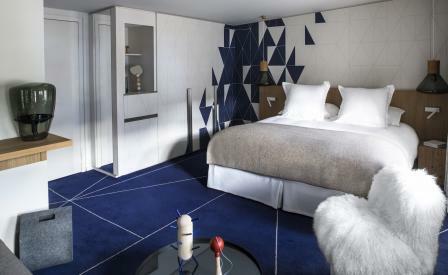 The Paris-based architect Jean-Michel Willemotte takes his cues from the surrounding snow-peaks rendering the mountainous silhouettes into geometric triangular lines that he repeats throughout the 25-room interior especially on walls. The cosy intimacy is reinforced by natural oak panels, shaggy-haired chairs, and brushed-white lacquered timber flooring. The best rooms in the house feature terraces or balconies that look out over steeply pitched church spires and ancien village roofs. There are aprés ski diversions aplenty including a session in the hammam, or a Visa-burning spin through Croisette’s shops.